British legend Suede to its first domestic concert on the 16th November in the Great Hall Lucerna bring as support insular indie trio Teleman. Teleman - formation composed of Thomas Sanders (vocals, guitar), Jonny Sanders (keyboards) and Pete Cattermoul (bass) was established in London recently on the foundations already broken band Pete and the Pirates. British newspaper The Guardian likens their style to Alt-J and Django Django. In January this year released their debut single on Cristina label Moshi Moshi Records, which produced Bernard Butler (The Libertines, The Cribs, Tricky). 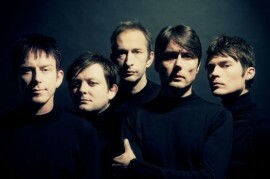 Suede started in the 90 great wave of Britpop years and were at that time the most popular on the island's music scene. Prague will present their fresh Bloodsports album, which was released in March this year as a result of the reunion in 2010 after seven years of inactivity. Named after the song Morrissey Suedehead founded in London in 1989 by bassist Mat Osman, singer Brett Anderson and his then girlfriend Justine Frischmann, who played the guitar. Soon they also joined guitarist Bernard Butler. The first studio recording of Be My God / Art and drummer Mike Joyce Although incurred but not because of a dispute with the record company never released. Shortly after, she became the permanent drummer Simon Gilbert left the band and Justine Frischmann. Without anything Suede released, spread around them positive expectations - on the cover of Melody Maker, for example, they received the designation "Best New British Band". The first single from The Drowners aroused enthusiasm, because they are distinguished from the then moribund Manchester and the grunge scene. The following singles were then entered the UK charts top 20 The first album Suede became the fastest selling debut since the board Welcome To The Pleasurdome from Frankie Goes to Hollywood and climbed right to the top of the charts. Suede is due to him becoming the most popular bands of the time and won the prestigious Mercury Music Prize for best album. The hysteria that surrounded them at home in the UK, with the ocean in the USA recurrence, plus the band because of the threat of court action forced to use the name The London Suede. While working on their second album left the band due to internal disputes Bernard Butler. Plate Dog Man Star finally came in 1994, their sound was darker and more nuanced than the famous debut. The band gradually joined by new guitarist Richard Oakes and keyboardist Neil Codling, who has participated in the preparation of the third album Coming Up. It is based in 1996 and the band is the greatest mainstream success - both in Europe, Asia and Canada. She got is ten singles on the top of the charts and has sold the most in the history of the band. In 1999 he published the fourth album Head Music produced by Steve Osborne, who worked with Happy Mondays and New Order, three years later, plate A New Morning. In the fall of 2003 Suede announced the closure of a breakup. In January 2010, confirmed the rumored - the band announced a reunion and return to the music scene. Suede played a charity concert at London's Royal Albert Hall followed by other performances, which met with a positive response from music media. At the same time its members began recording a new album Bloodsports who have seen the light of day in March 2013.